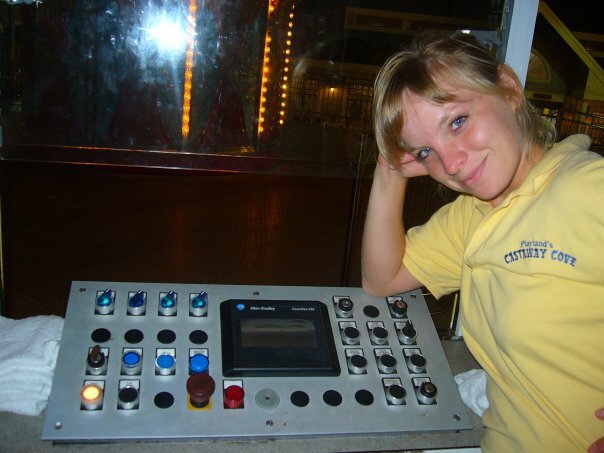 My die-hard friend Lilya and I started working as ride-operators in the amusement park the next morning after our epic arrival. From that day on, we nominated the #summer2007 as the most remarkable time in our entire lives. The introduction to the vibrant and rich American culture started with exploration of the grocery supermarket which was about 15 min of walk from our international students house. The store shelves stuffed to the fullest with at least three varieties of each product were overwhelming and the intensity of blasting air from air conditioners was tantamount to a Siberian winter storm. In one word, shopping was both super exciting and stressful. At first we gravitated to the foods that looked like those we used to eat in Russia yet they were profoundly different in taste and texture: white bread (pre-sliced and tasting like cotton balls), bologna (pre-cut and bearing hints of sodium and plastic), yogurt (pasty, with cloudy liquid on top), bananas (almost normal, except for the size), milk (cow’s milk… tasting like powdered concentrate), and of course, instant coffee McCafe (the black dust flavored with burned coffee beans). We eventually added to our morning bread and bologna sandwich a sweet multi-color paste in a can. It came in a chocolate, vanilla, strawberry, and confetti flavor and pertained to only one purpose: icing a cake. On our day off we could extend the exploration area beyond the grocery store by taking a stroll on the famous boardwalk neatly wrapped around the coastline of the Atlantic Ocean. It was packed with touristy attractions, ice cream shops, clothing stores, candy isles, fried dough places and, of course, restaurants. Nestled cozy among other establishments, the latter were big, nicely decorated and always exuding a rich flavor of cooked magic. I never visited even a single one of them, because, honestly, I cared not for having someone prepare my food, when I could grab a bag of chips and pair them up perfectly with the cheapest cold beer we could possibly afford. Pizza places were a different deal, however. We worshiped them as Seven Wonders of the World. We once received about twenty boxes of pizza (courtesy of our manager Brian) for the park workers and apprehended all twenty of them in about 0.5 seconds. On top of unbelievable flavor and combination of toppings, I was mesmerized with the SIZE of those pizzas: I could easily wrap myself into one of them and use it for a cover up. In the beginning of the summer season, we were treated to a staff party at a local pub. Every item on the menu was offered to us free of charge as a way of welcoming “the tired and the poor”, AND the hungry students. BIG MISTAKE! Well, to our defense, we couldn’t possibly predict the proportions of the salad dishes or the profoundness of the starters… So, each of eight of us at the table ordered a salad, an appetizer, and an entree. A normal progression of dinner, would you agree? But not in the US and not in a pub! The moment the salads started to appear we experienced our second cultural shock: an avalanche of plates, HUGE plates, with green leafy mountains and four cute microscopic tomatoes carefully placed on the rims descended onto our table with a distinct intensity. While we were still working on getting our vitamins in, the next load of plates arrived, this time filled with appetizers big enough to feed a family of ten. Before we could possibly clear out the remnants of the pre-game, the main course came crushing down on us. This time it was serious: the food was literally bulging out of the plates, causing more stress to already existent carpal tunnel syndromes of four poor waitresses trying to settle those hot platters on top of whatever we already had. We finally had to send a couple dishes back to the kitchen, because we couldn’t fit them on the surface of what used to be a table. Can you imagine the look of the park owner who then had to pay for us and our careless “I want to taste if all” attitude??? From the seat he was in I could literally feel the radiating waves of despair, utter disbelief, and, quite possibly, contemplation of a murder of all eight of us. Little should be said to explain why the summer party in the end of the summer was much tamer: the choices were limited to four items on the menu to avoid over-consumption and diminish chances of bankruptcy.